We see Raspberry Pi changing the way people teach, the way people make things, and the way they run their businesses. We’ve been particularly charmed to see how many artists use the Pi in their work too. Sometimes in places just on our doorstep. 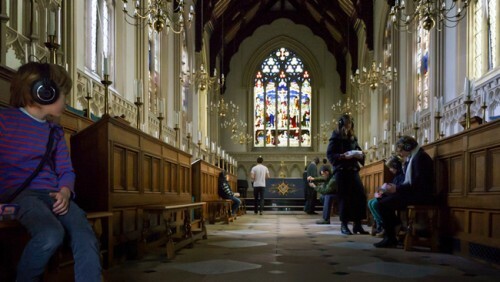 On Friday, I learned about a new installation at Corpus Christi college chapel here in Cambridge. Pre-Pi, if you were creating an art installation you’d likely be using Mac Minis or a laptop (or three) to perform any computational heavy lifting. The Raspberry Pi has changed the landscape for artists who want to incorporate computation or connectivity into their works: it means the tools available to them are much cheaper, and much smaller. The makers, Ludion (Tom Hall, Drew Milne and Barry Byford), describe Lichen Beacons as a “site-responsive installation involving spoken word texts, music, and photographs conveyed through a dialogue between Bluetooth beacons and Raspberry Pis with screens and headphones”. Corpus chapel is a place of calm and contemplation (unless you’re Laura, our copy editor, who got married to Pete in there a few years ago to the explosive strains of the Skyrim soundtrack, played on the organ); I can think of few places better for slowing down and taking time to breathe – aided by some thoughtful technology. After I saw this video, I pestered Barry to put some words online about the build process, and the way the poetry, music, ambient sounds and images came together. He’s really outdone himself: there’s an extraordinarily detailed background to the work (including the technical framework) available on Ludion’s website which you should really take some time to read. This installation is multi-layered, intensely thoughtful and designed to slow down the experience of the person encountering it. I’ll be dropping by to play with and listen to my own Pi inna box later in the week. We could all use a spot of contemplation once in a while. What an incredible use for the Pi. I had wondered about the practicalities of working with my school’s performing arts team to create a work which changes light\sound based on a performer’s position on the stage. This could be a way into it. Very, very well done to Barry and the artists involved. There’s another really great art/history/storytelling project using beacons (RFID this time) here: https://www.raspberrypi.org/blog/art-showcase-a-knights-peril/ – one of our favourites! The installation was for one day only but we are looking into other contexts and venues. Hey all! It's Rachel again. I have another amazing Art Showcase for you.